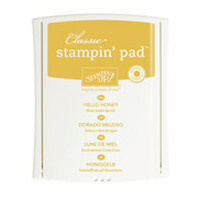 Day 5: Countdown to the NEW STAMPIN' UP! Catalog! On this card I used The Hostess Stamp Set Life's Adventure, In Colors Hello Honey and (my new favorite color) Blackberry Bliss, along with the Moonlight Designer Series Paper stack and the LUSH Blackberry Bliss Stitched Satin Ribbon. The bicycle slides along to reveal a stamped message behind it!